Navy aviation electronics technicians (ATs) repair some of the most advanced electronics systems in the world. Repair jobs can range from flight deck troubleshooting of the electronic weapons system on an F-14 Tomcat aircraft to changing computer circuit cards in an air-conditioned shop. Aviation electronics technicians troubleshoot and repair a number of complex electronics systems. Employing all the latest test equipment and procedures, ATs put that training to use repairing systems such as communications, navigation and infrared detection. You may also work on radar, laser and fiber optics systems, and repair digital computers and avionics systems. You cannot get the AT rating as a "guaranteed job" in your enlistment contract. 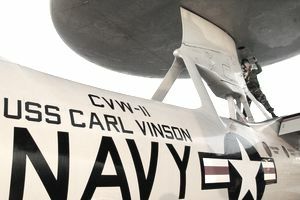 Volunteers for this rating enlist in the Navy as an Aviation Sailor (AV) and are selected for either this rating or the Aviation Electrician (AE) rating upon graduation from the technical training program. Sailors in this career field will perform duties at sea and ashore around the world. At various times they could be working at a land-based aircraft squadron or onboard an aircraft carrier, either indoors or outdoors, in a shop environment or in office surroundings, and at a clean lab bench or in a garage-type situation. They work closely with others, require little supervision, and do mental and physical work of a technical nature. After basic training, sailors in this job will spend 51 days in the common basics electronics course at the Naval Air Station in Pensacola, Florida for A-school, which is what the Navy calls its technical school. In order to be eligible for this rating (which is how the Navy refers to its jobs), you'll need a combined score of 222 on the arithmetic (AR), mathematical knowledge (MK), electronics (EL) and general science (GS) segments of the Armed Services Vocational Aptitude Battery (ASVAB) tests. You also could qualify with a combined 222 on the verbal (VE), AR, MK and mechanical comprehension (MC) portions of the ASVAB. In addition, you need to be able to qualify for a secret security clearance from the Department of Defense for this job. You'll be subject to a background check of your character and finances, and a history of drug or alcohol abuse may be disqualifying. You'll also need vision correctable to 20/20, normal color perception (no color blindness) and normal hearing .You also have to be a U.S. citizen. What Is a Navy Fire Controlman (FC)? What Does a Sonar Tech Do in the Navy? What Is a Navy Aviation Boatswains Mate - Handling (ABH)?